Singh had said he wondered whether Congress would have accepted Sonia Gandhi's leadership if she was not white-skinned. His comments drew condemnation from political parties and various women leaders. Union minister Giriraj Singh has been caught on camera saying that had Rajiv Gandhi married a “Nigerian” woman instead of the “fair-skinned” Sonia Gandhi, the Congress party would not have accepted her as its leader. Hours after the video became public, an appalled Nigerian High Commission demanded an apology, and said that it might file a complaint with the Ministry of External Affairs. The Congress condemned the remarks as “intemperate and distasteful”. Singh subsequently expressed “regret” over the statement, but complained that what he had said had been “off the record”. At an election meeting last year, Singh, who is the union Minister of State for Micro, Small and Medium Enterprises, had said that all those who were opposed to Narendra Modi should prepare to leave for Pakistan. Singh was in Hajipur, and was talking informally to reporters at the local Circuit House. Loud guffaws can be heard after his comments; Singh himself is seen smiling broadly in the video. In another part of the Hajipur video, Singh is purportedly heard comparing Rahul Gandhi’s current absence to the disappearance of Malaysia Airlines Flight 370, in which 239 passengers and crew were lost last year. “…Rahulji kahaan hain… yeh toh bhai… Asia ka ek jahaaj hai, kuchh gayab hua, aaj tak pataa nahin kahaan chalaa gaya… usi tarah se Congress netritwa… (Where is Rahulji… there was this aircraft that disappeared, no one knows where it went… in the same way, the Congress leadership…),” Singh purportedly says. In the afternoon, the Acting High Commissioner of Nigeria, O B Okongor, said the minister’s comments were “in very bad taste” and “unacceptable”. In Delhi, the Congress demanded Singh’s dismissal from the Ministry, and rejected the minister’s defence that he had spoken “off the record”. 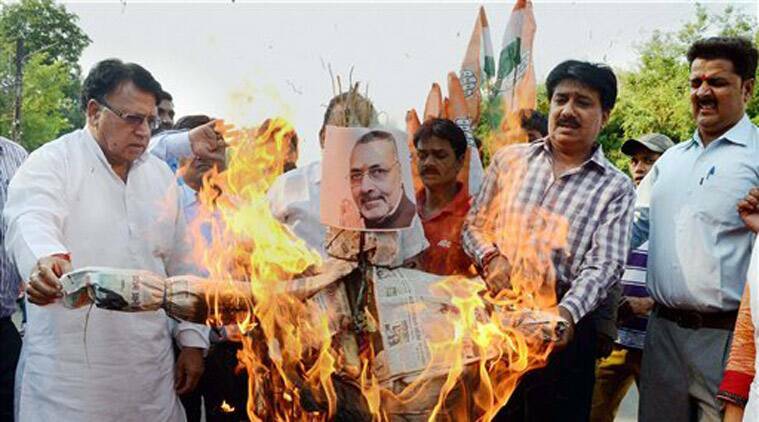 “Congress strongly deprecates and condemns the intemperate and distasteful remarks of union Minister Giriraj Singh bordering on insanity. It appears that the continuous quest to appease Prime Minister Modi has made him lose his balance. Such remarks are reflective of the lack of moral fibre in the BJP and its cadre,” Congress communications department head Randeep Surjewala said. Surjewala said Singh was known for “similar vexation in the past”, referring to his April 2014 comment about Modi’s opponents being packed off to Pakistan. He also mentioned an alleged theft at Singh’s Patna home in July last year, in which a sum bigger than what the minister had told the police was recovered from the alleged thief. “Perhaps he is the only person who refused to reclaim Rs 1.14 crore of currency as also US dollars recovered by police after apprehending those who committed a theft in his house. For conduct of this nature, he was rewarded by Prime Minister Modi by appointing him as a Minister in union cabinet,” Surjewala said. In response, BJP spokesperson GVL Narasimha Rao said that Singh has already expressed regret. “However, the moot question remains is that the Congress is a family-run political party and (Sonia) had become the president only by virtue of her marriage, not by merit. Congress needs to explain it.” he said. The Bihar BJP leadership, however, disowned Singh’s remarks. A senior BJP leader in Patna called the minister a “constant trouble-maker”. Singh, a prominent upper-caste Bhumihar leader from Lakhisarai, had caught the central leadership’s eye after he started to aggressively take on Nitish Kumar to defend Modi around the time of the split between the JD(U) and BJP in Bihar.